THE SEVENTH BOMBARDMENT GROUP (H) AAF, Tenth Air Force, has the distinction of participating in two World Wars and at one time having nineteen present day Generals as members of their organization. The Group was originally activated at Park Field, Tenn., on Oct. 1, 1919, as the 1st Army Observation Group, while two present squadrons of the Group participated in World War I. The 9th Bombardment Squadron (H) came into being provisionally on May 31, 1917, at Kelly Field, Texas, and was known at that time as the 9th Aero Observation Squadron. They arrived overseas in November of 1917 and had the duties of night flying and reconnaissance. They took part in three major battles; Battle of Lorraine, Battle of St. Mihiel, and the Meuse-Argonne Offensive. The present day insignia of the 7th Bombardment Group have those battles represented by three German Crosses. The 438th Bombardment Squadron also took part in World War I, and were known at that time as the 88th Reconnaissance Squadron. Their duties consisted mainly of reconnaissance flying. The Group itself, activated in 1919, was placed on the Air Corps inactive list in September 1921. Though one squadron of the Group, the llth, distinguished itself in 1919 when they took part in the history-making bombing of three Navy battleships under the supervision of Brig. Gen. Billy Mitchell, who had a major part in the foundation of today's U.S. Air Force. Placed on active duty in June, 1928, they moved to Rockwell Field, California. During the years 1928 to 1939 they were engaged mainly in the training of air cadets, making flights of mercy, dropping food and medical aid to persons marooned or lost, and taking part in many flying reviews for high ranking visitors. During that time they had many Group Commanders, among those Lt. Gen. Carl Spaatz, Lt. Gen. Ira C. Eaker, Lt. Gen. Lewis H. Brereton, Maj. Gen. Ralph Royce and a host of others. The present day commanding officer, Col. Harvey T. Alness, joined the Group as a 2nd Lt. and served under Lt. Gen. George E. Stratemeyer, under whom the Group performed so well during the India-Burma campaign, as a member of the Strategic Air Force. While the ground echelon was on the high seas the flying personnel had remained at Salt Lake City, departing from that field December 5th with 35 of the latest heavy bombers. Arriving in San Francisco they departed from Hamilton Field the next night for Hickam Field, Hawaii, arriving there shortly after the Japanese attack on the field. Along with the planes of the 7th Bomb Group were those of the 19th Bomb Group, both of whom would make history in the battle for Java. They departed from Hickam Field shortly after arrival as it was impossible to stay at the bomb-shattered field for repairs. Arriving at Brisbane, Australia, in January, 1942, they were met by the ground echelon and stationed at Camp Amerley Field in that city. During the time they were stationed there they were busily engaged in repairing and assembling the latest type aircraft hastily arriving from the States for the defense of the Philippines. At that time members of the flying echelon joined with the 29th Bomb Group as gunners and pilots on A-24's. Shortly after this merger, the llth Bomb Squadron and the 22nd Bomb Squadron were sent on secret orders to assist the 19th Bomb Group in the defense of Java. They played a great part in repulsing the enemy, allowing enough time to permit the evacuation of U.S. personnel from Java. They were returned to Australia in February and the Group prepared to move to a new secret station. Units of the Group had left previously on February 4, 1942, on the U.S.A.T. Willard A. Holbrook. 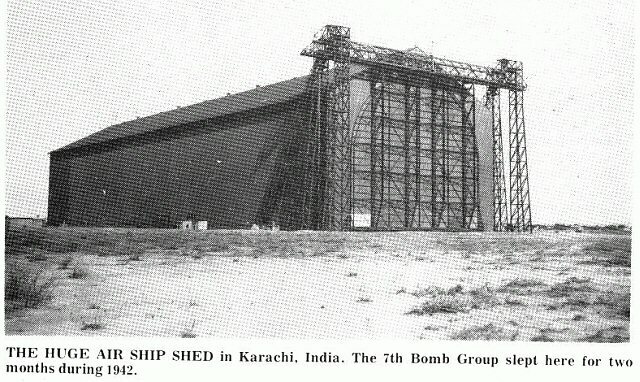 Arriving in Karachi, India, on March 12, 1942, they established headquarters at the Dirigible hangar seven miles east of Karachi. Almost at once the 7th Bomb Group, already veterans of battle with the Japanese in Java, proceeded to hit the enemy which was at that time attempting to move into Burma. They also aided greatly in the delivery of troops to Burma and on their return trip bringing out evacuees. While this was being carried out, other members of the command were hastily constructing a permanent air base for the Group. Many of the buildings were constructed out of packing crates and other various discarded materials. The men at that time were stationed in tents located near the newly constructed headquarters. Major Cecil E. Combs, originally with the famed 19th Bomb Group, was assigned to the Group at this time and assumed command. During the latter part of March and early April, new crews with the B-17 type airplanes arrived from the U.S. and although forward units of the Group stationed at Agra and Calcutta were already hitting the enemy, the training of these crews was undertaken to prepare them for the future air war against the Japanese in the China-Burma-India theater. The effective date of redesignation of the 88th Recon Squadron to the 436th Bomb Squadron (H) took place April 22, 1942. 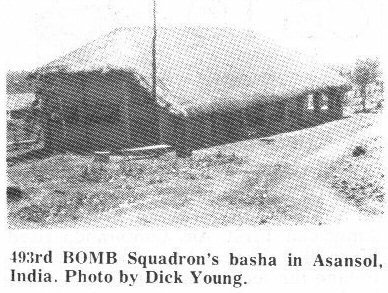 The ground echelon of the 9th Bomb Squadron moved out of Karachi by troop train for Allahabad to set up new quarters. About this time the 7th suffered their first casualties in the India-Burma war when a crew taking off from Asonsol, India, to bomb the enemy crashed on the take-off. Of course, the Group had lost a large percentage of men in the Java campaign, but this new loss was felt deeply as the lead pilot of the ship was an old-timer, Capt. Elmer L. Parcel. The llth Bomb Squadron that had distinguished itself and the 7th Bomb Group so well at Java were made a Medium Bombardment outfit and assigned to the Group, now using heavy and medium bombers. Shortly after converging into a Medium Bombardment Squadron, the llth was sent to China, one of the first bomber squadrons to hit the enemy in that country. Outstanding missions during this time consisted of bomber raids on Akyab, Rangoon and various other points in Burma. Losses were slight, though a number of crews failed to return, being destroyed in the air by Japanese Zeros. On June 7, 1942, a lone B-25 attacked Japanese installations in Burma, hitting the enemy at a low altitude of 300 feet. The plane was badly shot up, and the crew was forced to ditch the aircraft in the Bay of Bengal, making this one of the first ditchings of airplanes attempted in this war. They were rescued from the water by the commanding officer, Major Necrason, and a crew from the Chinese National Airways Corporation. On June 29th, combat crews and ground men from the 9th Bomb Squadron departed from India for the Middle East for duty in that theater, to repulse the Nazis then attempting an offensive against the new invasion forces of the U.S. Upon their departure from the theater, they were placed on D.S. with the Middle East Air Force. About this time the Group headquarters were moved to Calcutta and a drastic change took place. Hq. Hq. Squadron was disbanded and formed Headquarters, 7th Bomb Group, while the 341st Bomb Group (M) was formed from the llth and the 22nd Bomb Squadrons, long members of the veteran 7th Bomb Group. 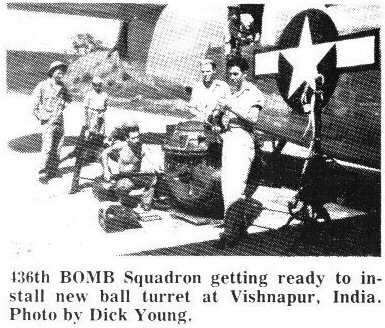 The remaining personnel of the 436th Bomb Squadron stayed on in Calcutta awaiting orders to activate two new heavy bombardment squadrons. On October 7, 1942, the 9th Bomb Squadron began returning to Karachi from their tour of duty in the Middle East. Some personnel of this Squadron remained in Africa where they formed a new Bombardment Group. On October 25, 1942, by order of the commanding general, Army Air Forces, the 492nd and 493d Bomb Squadrons (H) were activated from the squadrons and headquarters of the 7th Bomb Group and joined the Group, making the total strength four squadrons and headquarters. The Group was now prepared for increased action with the enemy now in control of the majority of Burma. In December, 1942, the Group began moving to their new base, set up especially for them at Pandaveswar, India, where later they were again to set bombing records, inaugurate new bombing techniques and receive high praise from the leaders of the Allied Armed Forces in Southeast Asia. At the end of 1942 the Squadrons of the 7th were still on the move to Pandaveswar, though the 492nd and 493d Squadrons were awaiting new men in Karachi. During the year 1942 the Group had participated in action against the enemy from bases in India and China, and spent several months carrying out raids in the Middle East. As the second full year of World War II got under way, the 7th was still engaged in moving, though they continued to strike the enemy from various India bases. Col. Necrason, commanding officer, was wounded on a mission to the Pyinmany railroad yards when heavy ack-ack was encountered. Besides the wounded, two ships were lost through enemy action. In May 1943, a formation was held honoring the famed Eddie Rickenbacher who spoke to the men and awarded medals to those who were hitting the enemy constantly in all types of weather. During the ensuing months, the bomber crews distinguished themselves by undertaking every possible type of mission, practical or impractical, for missions deep into Thailand, Burma and the Andaman Islands, flew over shark-infested waters, jungles notorious for head hunters, and through skies filled with enemy fighters. Individual planes flew alone against heavily fortified Rangoon at altitudes as low as 6,000 feet, virtually making that port useless to the Japanese. Many losses were sustained by the Group during this period. In the latter part of the year (1943), the Group began also to hit Japanese shipping in the Bay of Bengal, along with hitting airfields at Meiktila, Lashio and Rangoon, as well as destroying much enemy material stored at various points throughout Burma. During this period the Group was operating with the new type bomber, B-24, which replaced the delapidated B-17's brought from the States by the Group in 1942. On December 19, 1943, the heavies of the 7th flew the longest known bomber mission at that time to Bangkok, Thailand. The planes were in the air for a total period of 14 to 15 hours. During the early stages of 1944, the 7th, now a part of the newly formed 10th Air Force, continued to strike the enemy in Burma, Thailand and the Andaman Islands, inflicting heavy damage to their installations. At the start of the monsoon season, when it is impractical and impossible to fly deep into Burma and Thailand, the Group again moved, this time to Tezgaon and Kurmitola, located near Dacca, India. Here they started another new phase for the use of armed B-24's when they were assigned the task of hauling high octane gasoline over Japanese territory, infested with Jap planes, to the forward bases of the hard-pressed 14th Air Force in China, then, as now, in dire need of supplies. This practice continued until October 1944, during which time the Group suffered a number of losses due to take-off crashes, bad weather and other reasons. During the period from June to October, the Group hauled a total of 2,124,228 gallons of gasoline to the 14th Air Force. In October, the Group moved to their old home, Pandaveswar, where for the first part of their stay they concentrated in the training of pilots and bombardiers, readying them for the job of again making their air strength felt by the enemy. On Nov. 1, 1944, the campaign for destroying the Japanese lines of communications in Burma was begun, one crew from each squadron joined in flight to knock out the Dan Dara bridge on the strategically important Bangkok-Chi-engmai railroad line. This was but the first in a string of many bridges that would fall due to the excellent bombing of the 7th. The target at that time was termed by Strategic Air Force as the most important enemy target in Burma. During the remainder of the month, the Group continued to hit bridges, assisted in a search for members of a B-29 down in the Bay of Bengal, hit railroad sheds at Mokpalin, Burma, and on November 23d, they hit the important and vital Moulmein jetties, repeating the attack the following week, though enemy opposition was met and three aircraft failed to return. During December, the Group continued to hit Japanese positions and vital supply dumps. At the start of the year, 1945, the Group began in earnest to knock out bridges. During the remainder of January, bridges kept tumbling down with all four squadrons hitting the enemy line of communications time and time again. Their total up to January 1, 1945, had been five bridges, with the new method of bombing - Azon bombing, developed to a high degree by the Group, making it of use to the whole U.S. Air Force. This method of using radio controlled bombing had been tried in other theaters and declared unsatisfactory, but men of the 493d Bomb Squadron found it to be just the thing for knocking out bridges. While the 7th carried out its primary assignment of destroying the enemy lines of communication and prevented the movement of supplies in Burma and Thailand, it was called upon to support the 14th Air Force in China. Operating from Luliang, China, with Lt. Col. James F. Williford as commanding officer, heavy bombers of the 7th supplied high octane gasoline once again to the forward bases of the 14th Air Force. From its home base in India, supplies, personnel and gasoline were ferried into China, enabling the 14th Air Force and 20th Bomber Command to continue its operation against the enemy. In February, 1945, the Group was operational 20 out of 28 days, setting a new record in the number of bombs dropped. The 9th, 436th, and 492nd Bomb Squadrons hit Japanese troop concentrations day after day, while the 493d continued to destroy and damage the enemy's bridges on the Burma-Siam railroad now carrying the brunt of supplies to Jap troops in Burma. The pin point precision bombing by the squadrons hitting the troop concentrations resulted in the retake of Mandalay and other Central Burma towns by the British 14th Army. Beginning in March, 1945, the Group once again returned to their old haunt, Rangoon, hitting the Japanese Army's headquarters and inflicting considerable damage to the enemy port. During the month, the 7th set records anew when they flew the longest formation attack mission by heavy bombers deep into the Kra Isthmas, knocking out two bridges and damaging three others. The crews participating on this mission flew an average combat time of 17 hours and 30 minutes, quite a contrast to the 14 hours flown in 1943 when the Group hit Bangkok. Yet again in the latter part of March, the Group once more flew the 2900 mile trip, knocking out still more bridges. This brings the history to June, 1945, at which time the Group is again on the move, this time to Tezpur, India, where they will again supply high octane gasoline to the 14th Air Force in China. But not all of the Group are included in the move, as due to the success attained with Azon bombing, and the new technique of dive-bombing, the 493d Bomb Squadron is being sent to China to hit the enemy at that point. In the middle of August, peace rumors were heard daily and it seemed that the end of the war was definitely in sight. Fighting ceased on all fronts during the latter part of the month. The gas haul over "The Hump" continued, though at a much smaller rate. No planes were dispatched unless all conditions were favorable. On Sept. 9, 1945, the Group was placed in a Category IV status, with orders to haul a specified amount of gasoline to China, and then the Group's job was done. The gas haul was concluded Sept. 18, 1945, upon orders from the theater commander.